I have actually stayed at Fantasea Resort every year for the past 5 years. It offers a fantastic sea front bungalow setting at the peaceful end of Koh Phangan. 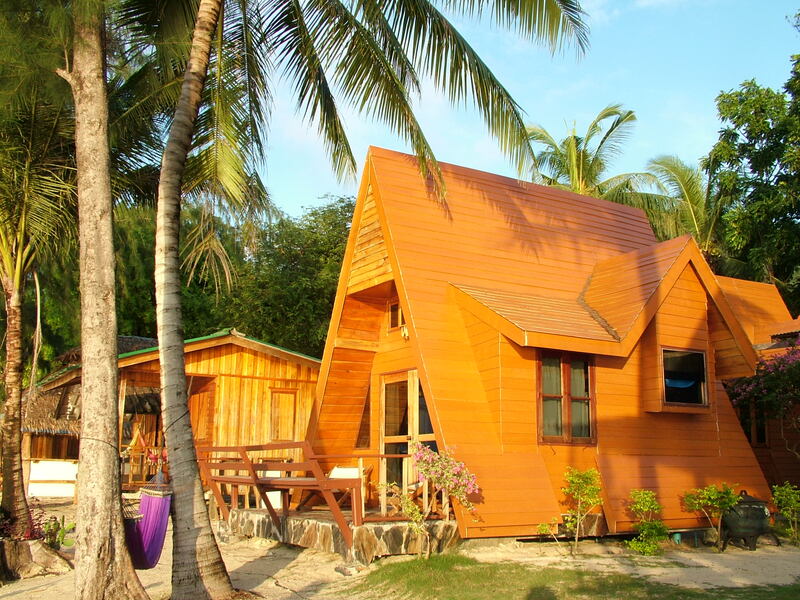 Ideal for partying at the full moon jamboree on the other side of the island and then chilling out in Chalok Lam Bay. The Bungalows have been upgraded recently and feature these Disney like A frames that are the best in the bay with full modern amenities such as air con and satellite TV etc. These work out a 60 Euros a Night. There is also a range of budget accomodation from just 10 Euros a night. The restaurant is again on the beach, almost in the sea and serves some really great food. The management are great and speak broken English which makes it more exciting for my liking. There is a diving centre just along the beach and in the town are lots of cafes and small bars that are very Thai although some more funky ones are just being built. Chalok Lam Bay itself is set in the picturesque Northern part of Koh Phangan in Thailand. The Bay is huge and is framed by the wonderful mountains across it’s entirity. Chalok Lam village is in the center of the bay and has markets and the usual shops and restaurants. It is a very typical rural Thai village as yet not taken over by pure commercialism. There are no fish and chip shops. The roads into Chalok Lam are dense in tropical vegetation and there are very few major developments to clutter up the skyline. Overall Chalok Lam Bay offers a great escape from the wilder times in the South of the island. There are plenty of water sports at various locations in the bay and just on th eoutskirts of the village an Elephant training camp offer rides through the jungle. There is a Chinese and Thai temple near the training camp that offer some great picture opportunities. There are plenty of bungalows all around the bay. The ones that have direct access to the beach tend to be located at the far ends of the bay. This entry was posted on August 8, 2008 at 9:29 am and is filed under koh phangan. You can follow any responses to this entry through the RSS 2.0 feed. You can leave a response, or trackback from your own site.